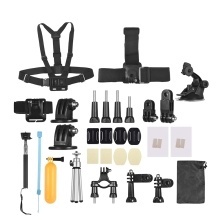 Complete kinds: 46-in-1 kit include almost all the necessary action camera accessories, including wearable accessories, riding accessories, bracket accessories, can meet your a variety of needs for outdoor activities photography. Wearable accessories: including chest strap, headstrap mount strap and wrist strap, free your hands when climbing, hiking, cycling etc. Riding accessories: including suction cup and bike handlebar holder mount, more convenient for your cycling, motocross, driving etc. Bracket accessories: including mini tripod and extendable selfie stick, with them can avoid the embarrassing thing to ask a stranger to take your picture. Convenient and practical: easy to install, the mini size won&apos;t take up much backpack space; one size fits all,applicable to all kinds of action cameras, as GoPro hero 7/6/5/4 SJCAM /YI etc. Camera in the picture is not included.